Tahira Hira ringing Wall Street bell. The recession and tight job market has spurred a lot of Iowans to tighten their financial belts and trim personal debt. An Iowa State University professor of personal finance and consumer economics says the key to managing credit cards is understanding your limits. Tahira Hira says you shouldn’t borrow money to consume. “You don’t artificially start to live a life which is not really your life…meaning, which you can not afford,” Hira said. Hira says credit cards can be very valuable in emergencies and for greater ease in transactions, but each card should be paid off, in full, every month. “The credit card does not generate extra or new money for you,” Hira said. “You only use (the card) to spend the money you have, so when the bill comes, you can pay that.” Hira recently helped launch a new online resource for people to improve their money-management skills. The project is called Money Sense. 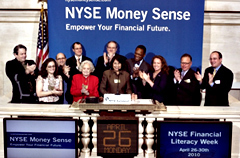 On April 26, Hira rang the opening bell at the New York Stock Exchange. A recent poll conducted by the Associated Press found nearly half of those surveyed say they’re suffering from debt-related stress. Hira says new government legislation to regulate credit card issuers should help people lessen their debt, but consumers need to take responsibility for themselves.